I came across this snippets site and I think its a damn good idea. You can store some interesting code snippets which you might have come across on the internet and it is available always. Very similar to del.icio.us but this is for code snippets. I have come across a lot of times when I say or hear other people say something like: "Oh! I had done this before somehow...but i seem to have forgotten it!" or "I had seen the soution to that when i was searching for something else but I dont know where on the web I found that code". Hmm...Why dont I come up with ideas like this which are very simple but are so useful? 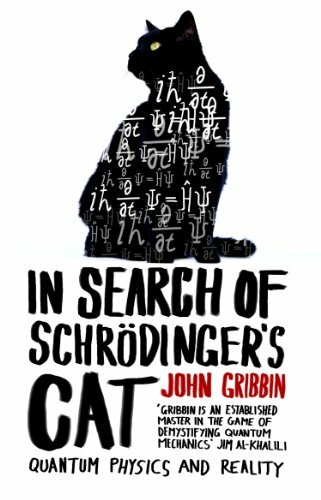 Time for a little quantum mechanics with Schrödinger's cat. Suppose you have a cat in a closed box, along with a radioactive particle. The particle has exactly a 50% chance of fissioning into two. If it does, the cat will be killed. If it doesn't, the cat will be okay. So, is the cat dead or alive? According to Schrödinger, the correct answer is both. Every time a sub-nuclear reaction takes place that has two possible outcomes, the universe is cloned. In one, the event occurred, in the other it didn't. The cat's alive in one universe, dead in another. Only when you open the box do you know which universe you are in. No wonder coding for the future is difficult. But think of code evolution along the same lines as a box full of Schrödinger's cats: every decision results in a different version of the future. How many possible futures can your code support? Which ones are more likely? How hard will it be to support them when the time comes? Dare you open the box? I recently finished reading this book. It is an awesome read if you are interested in what reality is and where modern physics is pointing to. It looks like the distinction between scientists and spiritualists is blurring away. The way you look at the world starts slowly changing. Especially the many worlds interpretation is a very interesting one. After reading it I have started thinking in that way unconciously. Imagine a box that contains a radioactive source, a detector that records the presence of radioactive particles, a glass bottle containing a poison such as cyanide, and a live Cat. The detector is switched on for just long enough so that there is 50-50 chance that one of the atoms in the radioactive material will decay. If the detector does record such an event, then the glass bottle is crushed and the cat dies; if not, the cat lives. We have no way of knowing the outcome of this experiment until we open the box to look inside. The whole experiment is governed by the rule that the superposition of both the outcomes of this is real until we look at the experiment, and that only at that instant of observation does the decision happen and one of the outcomes is seen. This theory says that both the outcomes of the experiment are equally real. The surprise is that according to this theory there is not one real cat but two. There is a live cat, and there is a dead cat; but they are located in different worlds. Faced with the decision, the whole world - the universe - split into two versions of itself, identical in all respects except that in one version the atom decayed and the cat died, while in the other the atom did not decay and the cat lived. It sounds like science fiction but it goes far deeper that any science fiction. It is a truth stranger than any fiction. I had not blogged for quite sometime now. 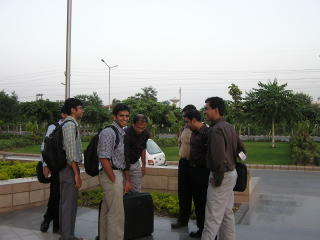 The reason is that I am now in Delhi (Gurgaon) for a week now and I was busy setting up stuff. We are put up in a hotel in gurgaon. We are here doing 'consulting' (whatever that means) for a client of ours. This is my team standing in front of our office excepting one who is taking the snap. Will put up nicer snaps when I get the time to shoot. This project seems to be challenging in terms of client facing, communicating, convincing, etc. Lets see how it goes. But one sad thing is that I had to cancel my trip to Leh because of this project. But as long as there is something new to learn,I am for it. Most of the people around me listen to music while working. I see them with ear-phones/ headphones, nodding their heads, enjoying their music, and their work. Even I have tried that lots of times, and miserably failed. I have found that if I am in the midst of something serious and interesting, which requires a lot of my concentration, I just can't listen to music. If I am listening to it, I lose the hang of whatever I am doing and my mind gets involved in the music. The music just takes over the whole of my mind and I sort of lose my context completely. I don't know. It might be that I am poor at concentration, or it may be that I am more interested in music, or it might also depend on what kind of music I listen to. I saw a very interesting piece of code in the SICP. It took quite sometime for me to understand it completely. In fact, the meaning flashed to me today during my morning jog! In a programmer's perspective, what exactly is data? This is a very subtle concept. Very difficult to explain. Data is something that is constructed and behaves in a particular way. i.e, What data is, is determined by how it behaves. How do you say this programmatically? - Data is that which is defined by constructors and procedures, together with specified conditions that these procedures must fulfill in order to be a valid representation. We never actually said what a pair was, only that there are procedures cons, car, and cdr for operating on pairs. But the only thing we need to know about these three operations is that if we glue two objects together using cons we can retrieve the objects using car and cdr. This point is illustrated strikingly by the fact that we could implement cons, car, and cdr without using any data structures at all but only using procedures. This blurs the distinction between 'procedure' and 'data'. Procedure <---> data. Data <---> procedure. Hmm...I need to think.